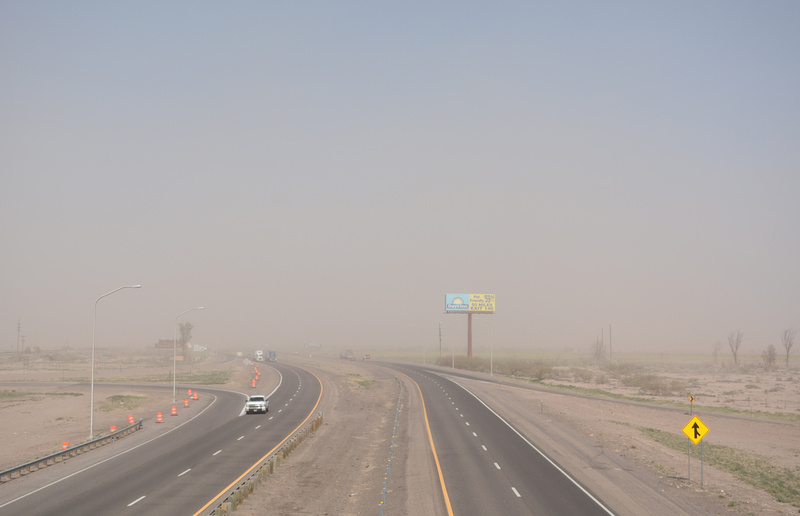 Interstate 10 at the east end of Business Loop I-10 (Pine Street) in Deming during a dust storm. Photo taken 04/25/17. Interstate 10 runs from Santa Monica, California to Jacksonville, Florida along the southernmost transcontinental route. Within New Mexico, the 164.26 mile long course commences across the Pelocillo Mountains from San Simon Valley in southeastern Arizona. Having replaced the majority of U.S. 80 throughout the Southwestern U.S., the former alignment converges with I-10 north at Road Forks in the Animas Valley. Continuing east across Animas Valley, I-10 arcs northward around the Pyramid Mountains to the city of Lordsburg. There U.S. 70 ties in from the northwest and commences a long and unmarked overlap with the freeway east to Las Cruces. Crossing the Continental Divide at Separ, Interstate 10 proceeds across high desert to the Luna County seat of Deming. A second business loop separates there along old U.S. 80 and U.S. 180 joins I-10 and U.S. 70. The freeway advances east by agricultural areas north of the Little Florida Mountains and Lewis Flats, traversing areas of the high desert plains until it drops into the Mesilla Valley at Las Cruces. U.S. 70 splits with I-10 east of Las Cruces International Airport (LRU), crossing the city north of Downtown. I-10 angles southeast with U.S. 180 to merge with the south end of Interstate 25 by New Mexico State University. The freeway turns south along the fertile Rio Grande Valley to Anthony, Texas. I-10 and U.S. 180 continue from there into El Paso. There are two active business loops for Interstate 10 in New Mexico, located in Lordsburg and Deming, and one former route in Las Cruces. All routes follow portions of old U.S. 80. Sign directing motorists from the Lordsburg Rest Area to Business Loop I-10 (Motel Drive) east into Lordsburg. The facility lies within the parclo interchange joining I-10 with the west end of Motel Drive (Exit 20). Photo taken 02/27/05. Reassurance shield for Business Loop I-10 westbound leading to I-10 in Deming. Business Loop Interstate 10 follows old U.S. 80 via Pine Street between trumpet interchanges at Exits 81 and 85. Photo taken 02/27/05. NM 404 (O&apos;Hara Road) links I-10 & U.S. 80 with NM 460 (Anthony Drive) at Anthony. NM 404 travels 9.0 miles between a roundabout at NM 213 and Anthony Drive (former U.S. 80 & 85). Photo taken 01/14/06. Eastbound NM 404 (O'Hara Road) at FR Route 1035 (Stern Drive), a service road paralleling I-10 northward 20.60 miles from NM 404 to Union Avenue in Las Cruces. This assembly was replaced with the addition of a sidewalk here by 2011. Photo taken 01/14/06. NM 404 meets Interstate 10 at a diamond interchange (Exit 162) just north of the Texas border. This exchange replace Exit 160 as the main access point into Anthony from I-10. Traffic lights and pedestrian signals were added here by 2011. Photo taken 01/14/06. 02/27/05 by Kevin Trinkle. 01/14/06 by AARoads.